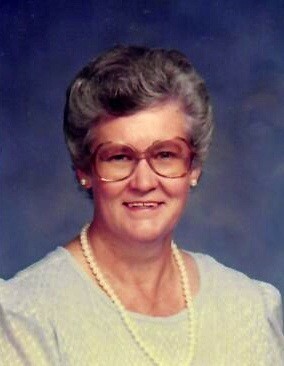 Nancy “Ayleen” Brown Leonard, 83, of Bennett, passed away Saturday, March 23, 2019 at Chatham Hospital. The funeral service will be held on Wednesday, March 27, 2019 at 11:00 a.m. at Pleasant Grove Christian Church, where she was a member, with Pastor Don Edwards presiding. Visitation will be on Tuesday, March 26, 2019 from 6:00-8:00 p.m. at Joyce-Brady Chapel and other times at the home. The family will also receive friends in the church after the committal service. Ayleen was born on January 1, 1936 to Fleta Lee Brown. She was a homemaker and was employed for 24 years at the Bennett School cafeteria. She enjoyed sewing, cooking, playing the piano and making homemade ice cream. She especially loved her family. In addition to her mother, Ayleen was preceded in death by her sister, India Brafford. She is survived by her husband of 63 years, Jesse R. Leonard; daughters, Julie Leonard Moss (Jim) of Asheboro, Anita Leonard Rives (Rocky) of Bear Creek; grandchildren, Rocky Rives, II, Corey Rives, Emily Copeland, Luke Moss; great-grandchildren, Tyler Rives, Adrian Rives, Brandon Rives, Jaymie Nooe, Lydia Rives, Lexa Moss; and sister Betty Teague of Bear Creek. Condolences may be offered online at www.joycebradychapel.com. Flowers are accepted or donations may be made to Pleasant Grove Christian Church, 5946 Pleasant Grove Church Rd., Bennett, NC 27208. Joyce-Brady Chapel is honored to serve the Leonard Family. | P.O. Box 89 3833 Chatham St.